SEOUL, South Korea, April 13, 2018 /PRNewswire/ — Eagon Windows and Doors, South Korea’s No.1 company specialized in manufacturing high-end AL windows and doors, announced on April 12th that it had earned PHI Component Certification accredited by Passive House Institute in Germany for Eagon Super Vacuum Glass. Eagon Super Vacuum Glass was developed through a variety of accumulated technologies. It is a next generation kind of glass that effectively blocks the transmission of heat and sound with a vacuum layer between two sheets of glass. The 27.3 mm glass realizes outstanding insulation (0.33 W/m2K) and acoustic performance. The vacuum layer in the glass prevents more than 50% of noise from passing through and enables superior thermal performance that is four times better than that of Low-E coating insulating glass. The super vacuum glass is an ideal option for ceilings and other parts of residential houses where a certain amount of ventilation and lighting are required. The product can also be used for many other purposes including curtain walls, display cases, solar thermal collectors, and greenhouses. 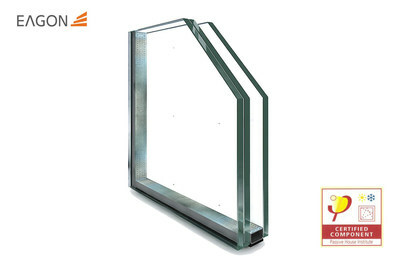 Eagon Windows & Doors became the world’s first company certified by Passive House Institute in the vacuum glass area. In recognition of the innovative technologies of Eagon Windows & Doors, the institute also gave the Korean company the Pilot Award in the Component Awards 2018, which is given to quality passive house component makers. Passive House Institute in Germany, which is thought to be the most prestigious green building certification center in the world, mentioned that Eagon Super Vacuum Glass showed outstanding technological progress beyond even those made in Europe, including Germany where the passive house concept is widely known. Passive House Institute also stated their belief that super vacuum glass will rise to become an alternative to the existing double glazing and triple glazing. Eagon Windows & Doors said, "This award proved our technological superiority over others in the Korean window and door market as well as our world-class capabilities in the global passive house industry. As the passive house concept has become a rising trend around the globe, we are actively developing related technologies so that we can export our products to Germany, the birthplace of the passive house concept."